My Mom has passed away and just wondering if anyone has a good knitted slipper pattern? She used to knit all our slippers and I am trying to learn so I can knit some for our family. I’m very sorry to hear about your mother. Its lovely that you are continuing her knitting tradition. 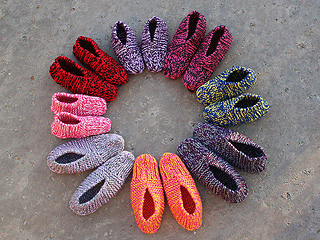 There’s a page of slippers on Ravelry but these were my first project when I learned to knit. Thanks for that pattern. It looks much like one I used when I was first knitting, and I’ve been trying to find the same one for quite some time.